Many people make resolutions at the start of the year, only to break them before the month is over. Addiction refers to not having control over doing, taking or using something to the point that it can be harmful to you. It's possible to be addicted to anything such as work, computers, shopping, and smoking, drinking or gambling. Studies suggest that addiction is genetic, but environmental factors such as being brought up by someone with an addiction are also thought to increase one's risk. Unemployment and poverty can also trigger addiction along with stress, emotional as well as professional pressure. Admit the purpose: If you're an alcoholic, you're not just drinking because you're parched. Admit to yourself that you're resorting to alcohol for anxiety, depression and pain. '" It's important to ask yourself "Why do you do it even after knowing it's harmful?". Keep in mind that you cannot change it unless you acknowledge it. Think realistically instead of denial: At a conscious level, you do understand that you're addiction is damaging, yet you go on at it and this may perplex you. Dr.Phil says that when one is in denial and constantly conning himself about it, it will never be possible for a person to get through the day without a shot of whisky. Hence, it's important that you count on others to help you think rationally! Utilize alternative coping skills: Dr.Phil suggests that one should replace bad habits with healthy ones. Don't give in easily; develop good coping mechanisms such as breathing exercises or relaxation techniques. Make changes in your routine: "It's not willpower, it's programming," Dr. Phil says. If you're trying to stop smoking or drinking, try uncomplicated things like not carrying money for cigarettes or throwing away all the alcoholic beverages in the shelf. Remember that the best way to stop an addiction is to not have access to it." Be answerable and have a support system: This not only means that the person you're accountable to will support you, but will also bring you back to reality every time you sway towards addiction. Involve your friends and family members in your effort to kick the habit! 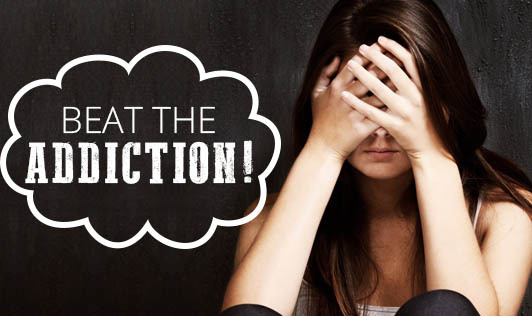 Reward yourself: To fight an addiction can be very difficult but it's not impossible. Whenever you see yourself making progress, even tiny baby steps, you have to motivate yourself to keep going.